Sometimes vendors need to do the heavy lifting for users in order to encourage adoption. This is especially so in situations where vendors are trying to disrupt an existing market player. Case in point: SlideRocket, the presentation application that is trying to move sales personnel away from their attachment to PowerPoint by offering interactivity and analytics. 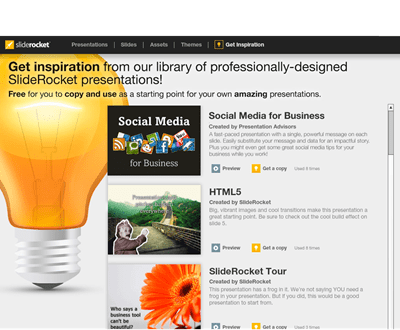 I’ve used SlideRocket reasonably extensively but even I find myself going back to what I know and what has an extensive resource base of tools, animations, themes and templates or – PowerPoint. In order to answer this [problem, SlideRocket is today introducing a content gallery of very slick presentations created by some experienced presenters. They’ve also released polished presentations which can be used as the basis for further customization. SlideRocket are pitching this as more than simply a content gallery – they’re claiming to have invested time and effort to create examples that fulfill all the psychological requirements for an effective presentation including emotional connections and audience focus. I’m not sure about that – I’ll leave it o my psychology-major friends to assess that but quite simply – the examples provide a previously missing starting point for new SlideRocket users. This is a simple release but really fundamental – people need inspiration and clues as to how to use a new tool – until now SlideRocket didn’t answer that fundamental need. This new release answers that missing piece and I’d expect to see a positive impact upon user numbers and, more importantly, adoption. Other companies need to think about how they can ease the on-ramp for new users in similar ways.